The Glock 43 handgun was one of the most highly anticipated reveals from the Glock brand. The subcompact pistol has an upgraded grip, an ergonomic design, and it was made to improve the concealed carry market. However, everyone should be able to make their Glock unique to them, so we’ve put together this review of the best Glock 43 mods on the market. The most important factor in modifying any weapon is to pay mind to what makes that weapon unique and well-performing, and focus on improving the areas where it may be lacking. 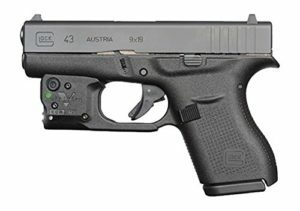 The Glock 43 design is about letting the owner grip the pistol high and tight, keeping a firm hold, and firing quick and short rounds. While most of the modifications included in this review are intended for a self defense weapon, we did keep tactical purposes in mind as well. No matter which area of your Glock 43 you want to improve on, you can expect the overall performance of your weapon to go only up. Materials – Hogue’s beavertail grip sleeve is one of the simplest Glock 43 modifications on this review and in general. The sleeve is made of a flexible rubber, which only needs to be stretched over your Glock’s original grip and slid into place. It will remain tight and secure during its use. The beavertail shape is identical to your Glock 43’s beavertail grip, and the sleeve also continues a similar cobblestone style texture, so there is a minimal difference in appearance and feel between the original grip and grip sleeve. 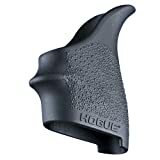 The sleeve also has the addition of finger grooves at the front of the grip, so the shooter can have an enhanced hold of their subcompact pistol during firing. Performance – Obviously, the grip sleeve for your Glock 43 is the cheapest modification within this review. Although this is not an extravagant choice, Hogue does a great job of streamlining the existing style and design of the original grip and adding enhancements where it’s needed. The grip sleeve maintains the beavertail style and the raised texture on the sides, but it adds the finger grooves that the Glock is lacking. At the end of the day, this does nothing but increase the shooter’s overall hand grip and performance. It will also increase the palm swell, which could be inhibiting to some on a subcompact pistol. The shape is already ergonomic, and you won’t want to overdo what has already been innovated. What we say – This option is the best Glock 43 modification for shooters who feel more comfortable with finger grooves, as opposed to the flat front end of the Glock’s original grip. Rubber gloves long sleeve is light weight offering a precision rubber fit for your hand gun. Quality is assured and maintained up-to current market standards grips is composed such as it stretches to fit for easy Installation. Materials – The AmeriGlo Classic Sights are a pair of night sights, including a front and rear piece. Both pieces are constructed from machined steel in a matte, black finish. There are three bright green tritium inserts: two in the rear sight and one in the front. All inserts are surrounded by a highly contrasting painted white circle, to increase the shooter’s accuracy. The rear sight is a classically designed dovetail shape, with a wide viewing point that doesn’t interfere with aiming your target. The AmeriGlo brand is frequently used by law enforcement, military, and many conceal carry shooters. Traditional night sights will need the aid of a gunsmith for professional installation. Performance – A well performing pair of night sights can be a literal lifesaver on a Glock, when it comes to self defense. This AmeriGlo set has a fairly discrete and classic design – there’s nothing too flashy going on here. The tritium inserts, paired with the contrasting rings, can severely increase a shooter’s accuracy and trim down the time on target acquisition without being too noticeable. Unless you own the proper tooling (which is pretty expensive on its own), you’ll need to have the sights professionally installed. This will cost you some more money in the long run, but this permanent modification if one of the best you can make to your handgun. What we say – The AmeriGlo night sights are the best option for shooters who need to use a self defense weapon at night and want to increase their target accuracy. 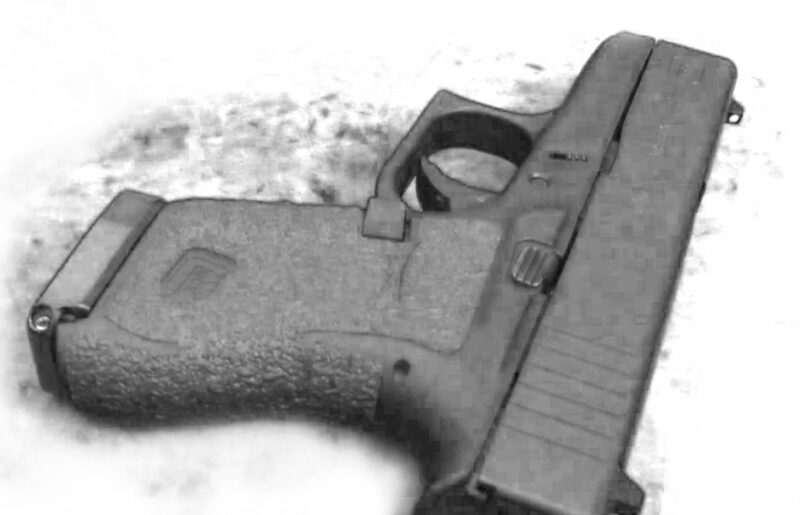 Materials – The Glock 43 laser by Viridian is a fairly well known style of modification. Unique to the Viridian brand is the ECR Instant On feature, allowing the attached laser to instantly turn on and turn off when it is drawn from and returned to the complementary holster. This is a green laser, which emits a power just under the Class IIIA emission limits, offering the strongest and brightest beam possible. The green laser can be seen up to two miles out at night and up to one hundred yards in the daylight. The battery provides up to two hours of constant on power. For installation, it can be simply installed over your Glock’s existing trigger guard. Performance – At first glance, there’s nothing but positive things to say about this laser Glock mod from Viridian. It installs very easily, it provides one of the most powerful laser beams that is legally allowed to civilian shooters, and it doesn’t require you to press a single button or switch to activate it. That can save crucial moments in a self defense situation (or tactical situation, for that matter too). What’s not ideal is that the Veridian instant on holster in an outside the waistband holster, and you can’t use it for conceal carry. While all of Veridian’s laser features are great reasons to purchase it, the holster can leave many shooters limited. What we say – This is the best Glock 43 mod for shooters who have some tactical purposes in mind or need a laser that is highly visible during both day and night. ECR INSTANT ON: Includes a sleek Instant-On ECR holster that activates the world's brightest laser when drawn. No fumbling with buttons in critical situations. When you draw, it's on! LASER RANGE: The green laser sight creates a visible target up to 2 miles at night and up to 100 yards in daylight. This laser is powered to the maximum legal strength. 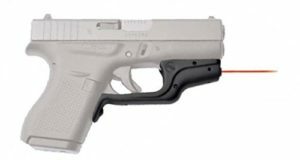 Materials – The red laser, offered by Crimson Trace, is another trigger guard laser. However, it does not feature an instant-on activation and will not require a special outside the waistband holster like the previous option. You can utilize this laser with any inside the waistband holster that will accommodate the size. The instinctive activation is utilized by a pressure switch; simply tap your finger to turn the laser on or off. Activation is also ambidextrous, and the shape of the laser’s housing has been ergonomically designed for a comfortable grip. The laser puts out a Class 3R beam emission, and it will be seen best during low light or night time. Performance – Although this is another laser within this review, it has some more standard features and is one of the most popular laser modifications anyone can purchase on the market. Crimson Trace’s red laserguard installs just as easily as any other. While it doesn’t have an instant on feature, it does activate very quickly with the tap on a finger. Plus, you can use any holster with it, so long as it compensates for the room needed. With all that in mind, this is a more expensive option, and it’s not a cheap investment to make. However, you can expect your laser to stay in great shape and last through a long life. What we say – The Crimson Trace Red Laserguard is the best purchase for those using their weapon for self defense or concealed carry and would still like a laser. Our favorite modification for Glock 43 pistols was the AmeriGlo Classic Sights. Not only are they an affordable modification, but they are an upgrade to the Glock original sights without inhibiting on the other great aspects of the handgun. 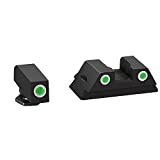 The dovetail rear sight and contrasting colors will help you acquire your target in any lighting situation, so this will be great for even just use on the range. However, you can improve your abilities as well during self defense and tactical purposes. You may have to make an additional investment of getting the sights professionally installed, but this is a “one and done” type of investment. Replacing the tritium inserts will be cheap and should not have to occur frequently. This is one of the few Glock mods that don’t require batteries, so maintenance is low and affordable. AmeriGlo is a trustworthy brand that has consistently provided gunowners with high quality products that should last the lifetime of your weapon. If you’re making any sort of modification to your Glock 43, start with a reliable pair of night sights.